This is no ordinary transformation project and must have put the architects in charge under serious pressure to perform, but they really rose to the challenge, as you'll soon see! Anyway, that's enough talking, as we know you're keen to see some pictures, so let's get to them! Just look at the fantastic dialogue the architects have created here! A wonderfully traditional settler's home has accepted a new, concrete annexe with ease and it actually makes the entire property look more contemporary, as a whole. The muted gray palette looks so good! 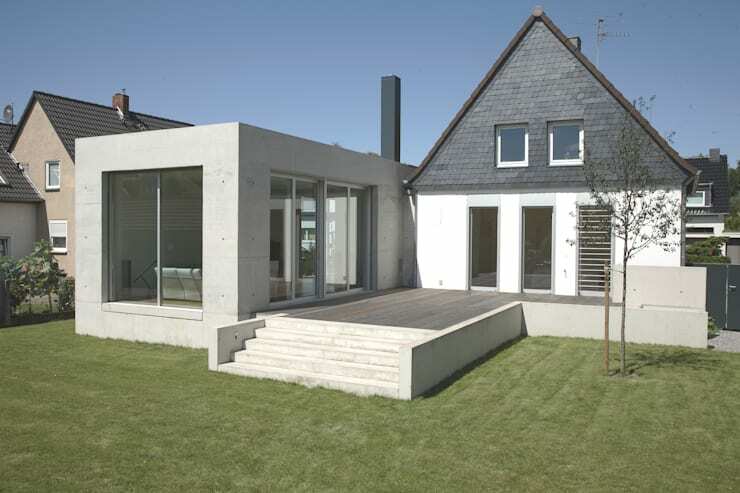 We are a little bit in love with this annexe, if we can be honest. Though the construction is simple, the inclusion of lots of glazing has really lifted the industrial look and must have drawn endless light inside as well. Who knew such contrasting designs could work so well? It was always going to be difficult to blend a strikingly new building with a traditional one, but this terrace has managed it with such aplomb! 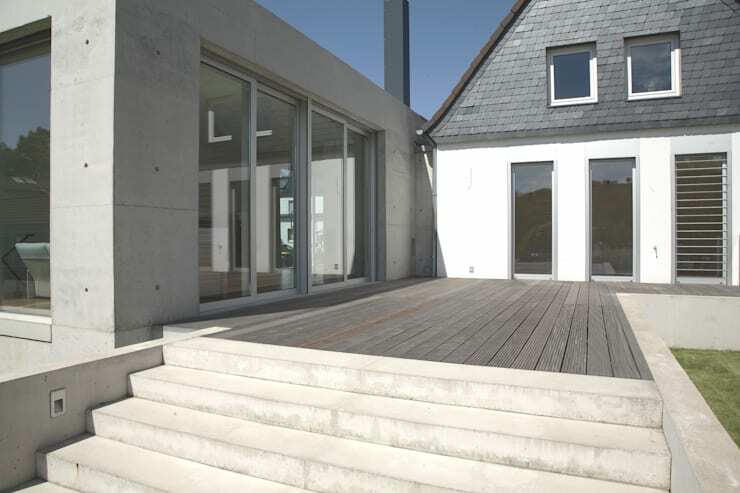 Concrete steps that mirror the annexe seamlessly transition into wooden decking, which marries up to the old house so well and reflects the exterior shingle cladding as well. What a cohesive collection of shapes and finishes! This picture really shows how much curb appeal this house has, from the street! 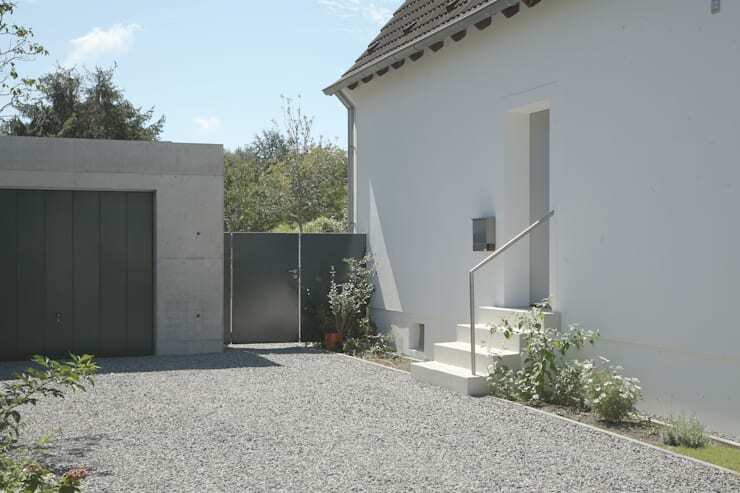 Here you can see the new garage, industrial garden gates and a wonderfully simple driveway design that helps to marry the old and new elements all together. 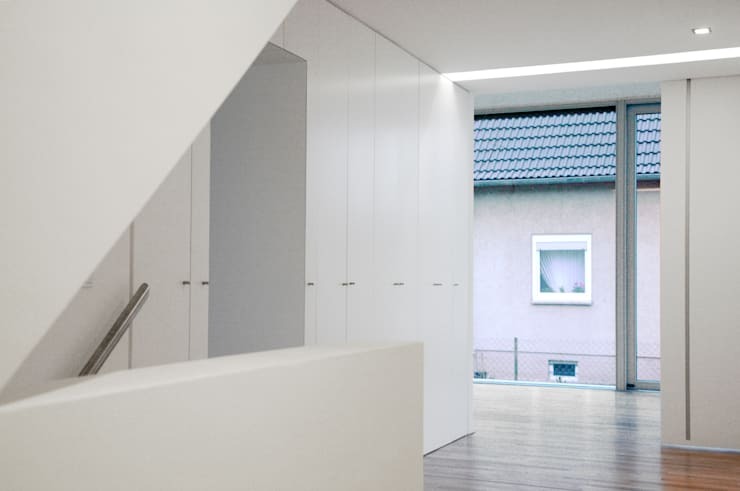 Does bright white render ever look anything other than fabulous? We don't think so! We KNEW all those windows were filling the annexe interior with light and here's the proof! 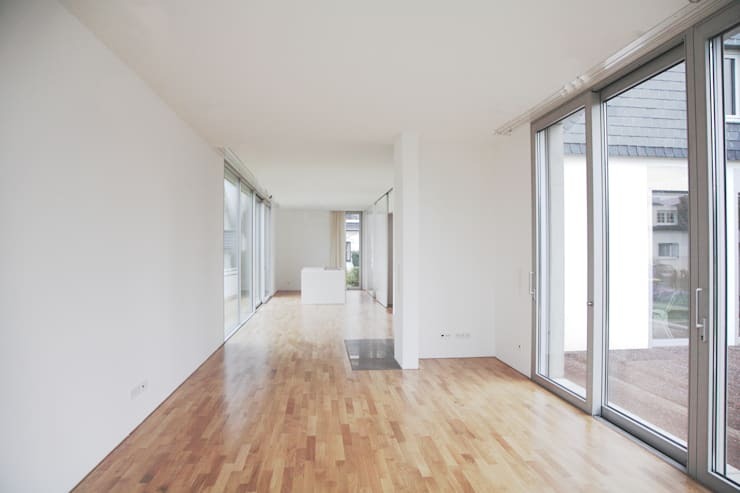 Understated white walls and natural wood flooring keep the look here contemporary and minimal, which is a lovely reflection of the exterior of this new extension. Ahhh, so this annexe isn't totally simple, as it has sneaky storage built in wherever possible! We don't envy the owners, having to decide which part of the house to spend time in, as we are sure the old house must be just as inviting and beguiling, albeit in a different way! If you loved this amazing hybrid home, take a look at this Ideabook: This Home Is A Minimalist Hybrid Of Indoor And Outdoor Spaces. 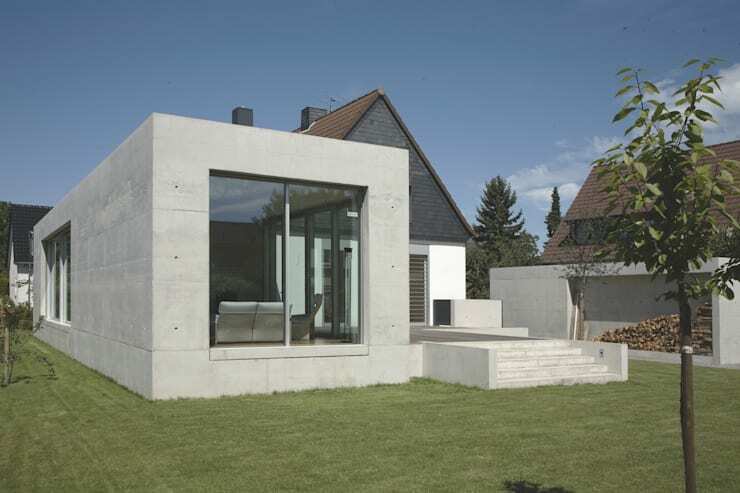 Do you like the combination of old and new styles here?